What an enjoyable, intricate view of alternative politics, showing several sides of the same argument. It gave a balanced intelligent picture which was very thought-provoking, but added to that was an underlying tale of drama and intrigue which kept on building magnificently. Even the English grammar was good – what more can you ask?! Horribly believable and absolutely compelling, Shades of Green is one of my favourite reads of 2014. 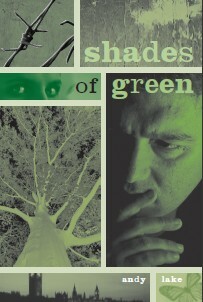 Shades of Green, by Andy Lake, is powerful, unsettling, chilling and enlightening. It is a compelling, page-turning read that kept me up late many evenings because I absolutely had to know what happened next. The story begins just before a nuclear disaster in Europe unleashes a radioactive cloud that blows into Britain. In the spirit of never letting a good crisis go to waste, a minor Green party steps up to aid the populace. By the time Parliamentary elections come round, the environment is the leading issue in people’s minds, and the Greens form a coalition government. But, as the story points out, there are various shades of green, from a simple belief in doing things more efficiently and with fewer resources to Malthusians who actively seek to reduce the population of the UK and, ultimately, the planet. Shades of Green takes the reader inside the workings of the new Green government where we witness the impassioned plans to save the planet and the continuous escalation of pressure on the populace. After all, each new plan is designed to save Mother Earth. As environmental extremists rise to prominence in the government many of those plans become increasingly secret, as re-education policies are enacted. I won’t reveal more of the plot, but will say that Lake understands the radical game plan and how it would be enacted. People have a tendency to take things too far. This excellent and believable read shows just how easily that can happen. I was surprised that the author, Andy Lake, could so clearly give us both sides of the issue, give each character their own voice and ideology, and make us see how something similar is possible. This exceptional political thriller is filled with amazing characters, eye-opening ideology and thought-provoking beliefs. I thoroughly enjoyed looking at the chaos of the political machine from this perspective. Shades of Green takes us along on a Green Revolution in England. When the Green Earth Movement unexpectedly wins the elections and installs a new prime minister not all is as it seems. The new eco villages, the projects to dismantle the economy and rely on gardening and the local economy are not well received by everyone. “Shades of Green is a fast paced political thriller centred around the accession to power of environmental political parties and movements. The book cleverly lays out the broad and complex range of issues and points of view that radiate from concerns to protect the environment from human exploitation. And the how, where and when these start to come into conflict with the population’s immediate and future needs and demands on the environment. As shared concerns to protect the environment start to fracture and extremists start to take control,protecting the environment starts to take precedence over protecting people with horrifying consequences. The author manages to show, with frightening credibility, how good motives and intentions can so easily and imperceptibly slide into terrible ones before anyone,except a relatively helpless few, realises. This turns out to be a salutory tale of what can happen when ideals become unmoored from humanity. Many Darkening Greens. Will Other Political Colours Fight Back? “Shades of Green is certainly not similar to a similarly titled popular shade. This is a deep political thriller, set in a United Kingdom in which the political balance is gradually lost. In this story, danger comes from the left, from a sort of green quasi national-socialism that is allowed to run out of control. We see how an evil mind-set and then terrifying manipulation of a population can grow out of benign belief hijacked by extremists.